After a very successful tour of the Patagonia Lake area we were soon in the Huachuca Mountains, specifically Miller Canyon. In this canyon is 'Beatty's' – a house plus a couple of bed-and-breakfast cottages. 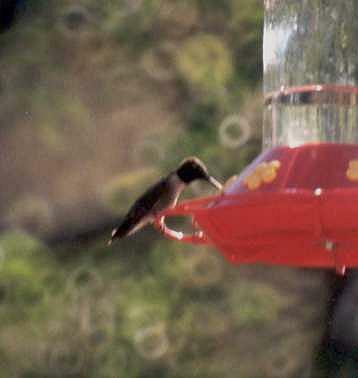 More importantly there are about 14 hummingbird feeders in two specific areas. At the first site Tom, the owner, has kindly provided seating and a canopy for shelter. The feeders at the first site are numbered or lettered for ease when shouting where a bird is. The three of us had the place to ourselves for a while. Within about 15 minutes we had seen Broad-tailed, Black-chinned, Anna's, Broad-billed, Blue-throated (male and female), Calliope, Rufous and Lucifer Hummingbirds (female Lucifer). On and beneath the seed feeders were Black-headed Grosbeak, House Finch, Lark Sparrow and Yellow-eyed Junco. Heard-only species were Hutton's Vireo, Mexican Jay and Western Tanager. A group of about 16 British birders were due so we moved on a couple of hundred metres, to the other canopied seating area with more hummer feeders. We sat and agreed how we would number the feeders to indicate what was where. Hummers were everywhere – Broad-tailed and Broad-billed, Anna's, a fine male Magnificent and the heard-about and much-hoped-for female White-eared Hummingbird. Melody spotted this, couldn't remember the feeder number and pointed frantically. 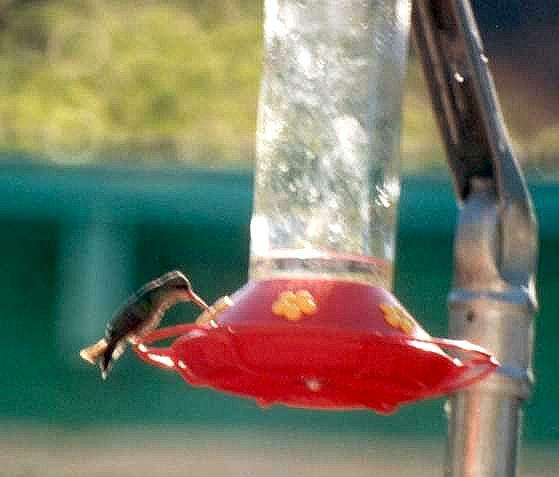 Fortunately the bird stayed still for a while so we could all see it – it was on the closest feeder! By now it was quite late and the sun was beginning to set. We did a quick drive to Garden Canyon, getting on the way a couple of Red-tailed Hawks and a Swainson's Hawk, American Kestrel, Eastern Meadowlark, Turkey Vulture, a lone Loggerhead Shrike (which warranted a quick stop), Gila Woodpecker, Northern Flicker and Mexican Jay. When we reached Garden Canyon, at 6.22pm, the sun had gone behind the mountain and everywhere was silent. I mean silent. Not a bird seen or heard anywhere. We had hoped to get the elusive and by now mythical Painted Redstart but things didn't look too hopeful. We stopped mid-canyon and walked up the road - still silence. Not a thing. We had almost decided to give up and head back when Melody thought it would be worth trying to attract something. Attract what we wondered? It was still silent. Melody began doing a very creditable impression of a Northern Pygmy-owl. Still silence (except for Melody). Then she pointed to nothing we could see. Suddenly it was there: a male Elegant Trogon. It appeared out of nowhere and sat on a branch somewhat obscured by another branch at about knee level. The only way to see the whole bird was obvious so I dived to the road surface, ignoring the stones digging into my chest, and delightedly watched this fantastic-looking bird. It didn't utter a sound, watched us for about a minute, then disappeared in a flash of colour never to be seen again. The canyon was still silent, and getting darker so we headed back down. Almost finally, we stopped by a pool where there were hundreds of Mourning Doves getting ready to roost and making most peculiar noises. As we watched and listened we saw a Lesser Nighthawk and two Common Nighthawks, plus Mallard, American Coot, Killdeer, Red-winged Blackbird and Lark Sparrow. Finally, as we left here in almost total darkness, a sudden stop was caused by a singing Botteri's Sparrow in a roadside bush. This day with Melody saw us birding dawn 'til dusk, from 4.30am 'til about 7.30pm. We had 131 species!